Interested in current issues? Want to EXPRESS YOUR ideas globally? Ready to write about it? Then apply for the ongoing Queen’s Commonwealth Essay Competition. 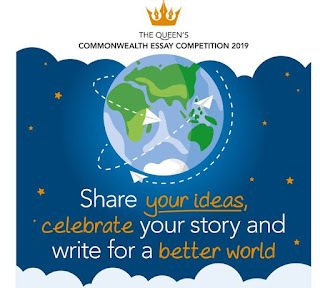 The Queen’s Commonwealth Essay Competition is the world’s oldest schools’ international writing competition, established in 1883. With thousands of young people taking part every year,it is an important way for the young voice of the Commonwealth to be developed and heard. writers to explore how the Commonwealth can address global challenges and work to create a better future for all citizens, particularly young people. All entrants receive a Certificate of Participation and one Winner and Runner-up from both the Senior and Junior categories will be invited to attend Winners' Week in London. Past winners include author Elspeth Huxley, Pulitzer Prize winning journalist Mei Fong, and the Prime Minister of Singapore Lee Hsien Loong. ‘You are the most optimistic, connected generation the world has ever known.’ HRH The Duke of Sussex. How can you use Commonwealth connections for positive change? Connected by the oceans; can we work together to protect the environment? ‘We are all now connected by the Internet’ – Stephen Hawking. What does the future hold for humankind? Family, Community, Nation, Commonwealth. What are the opportunities for shared, sustainable growth? The competition is open to nationals or residents of all Commonwealth countries and territories, as well as residents of The Gambia, the Maldives and Zimbabwe. Residents of non-Commonwealth countries whose entries are submitted through their local RCS branch are also eligible. Entrants must select a Senior or Junior topic depending on their age on 1st May 2017. Senior entrants must be born between 2nd June 1999 and 1st June 2004 (14-18) and Junior entrants must be born after 31st May 2004 (under 14 years of age). The maximum word counts are 1,500 words for Senior entries and 750 words for Junior entries. These word limits apply to all topics and all formats (essay, poem, letter, etc). Exceeding the word count will result in automatic disqualification. Read the competition’s Terms and Conditions and shown your parents? Checked for spelling, grammar, punctuation and plagiarism? If you answered ‘yes’ to all of the above, then you are ready to enter The Queen’s Commonwealth Essay Competition. Offline submissions are very difficult to process and can mean that your entry arrives after the Competition closing date. We will only accept an offline entry where the person submitting has no access to internet and is unable to submit online. If you are submitting your entry by post, please complete an entry form in block capitals and attach it to the front of your essay. Entries should be sent to your nearest postal hub, details of which are listed below. Please note that for postal entries, your essay must be received by 1 May 2019 in order to be eligible. We therefore suggest that you send your essay with plenty of time for delivery, as essays received by a postal hub after 1 May will not be considered in the competition. Please ensure your envelope is clearly labelled with ‘The Queen’s Commonwealth Essay Competition’. All individuals and schools are encouraged to enter online if possible. Deadline: All online entries must be submitted before midnight (GMT) on 1st June 2019; any offline entries must arrive at RCS London by 1st May 2019.